There’s been plenty of speculation surrounding Marshal Yanda’s playing future. Yanda, who turns 35 in September, enters the final year of his current contract with the Ravens, but don’t expect the seven-time Pro Bowler to hang up the cleats just yet. At least that’s the expectation around 1 Winning Drive. 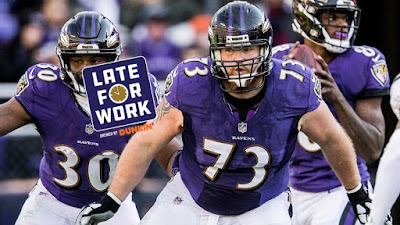 General Manager Eric DeCosta made it clear at the Ravens’ pre-draft presser on Tuesday that he wants Yanda around for the 2019 season and beyond. Head Coach John Harbaugh echoed that sentiment at the Combine when asked about Yanda’s future with the team. 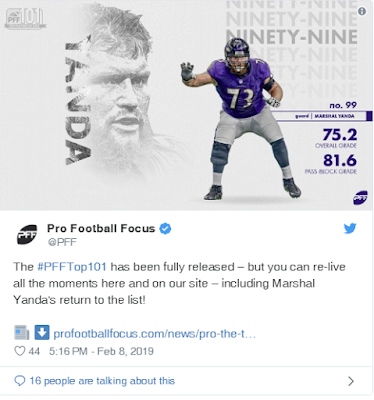 The question keeps being asked, however, because the private Yanda hasn’t come out and explicitly said himself whether he will play in 2019. “Less than a month from the NFL draft, the Ravens have no definitive answer on whether Marshal Yanda is coming back,” wrote The Baltimore Sun’s Jonas Shaffer. It doesn’t take much to notice the direct correlation between Yanda’s presence and the Ravens’ offensive success. Just ask running back Gus Edwards, who had the NFL’s highest rushing grade on runs between the right guard and right tackle, according to Pro Football Focus (PFF). 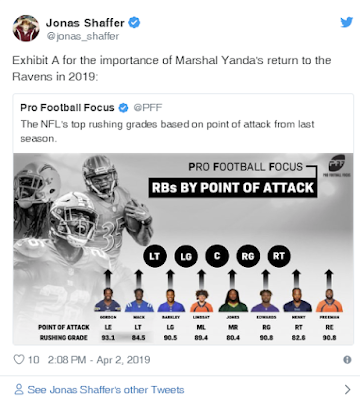 As the Ravens plan to retool their offense and establish a strong run game under Offensive Coordinator Greg Roman, Yanda will be a centerpiece around the success.